easy-off safe graffiti removal kits are perfect for individuals, young or old, looking to tackle graffiti vandalism in their neighbourhood. Chosen by community groups and often issued to members of the general public, school pupils or Scout Groups, these fully recyclable easy-off safe graffiti removal kits contain everything you need to clean graffiti from all vandalised non-porous surfaces. Designed primarily with user safety in mind easy-off graffiti removal kits can be confidently handed out at community clean-up days and enable anyone to effortlessly remove graffiti tags and spray paint vandalism from play park equipment, subways, street furniture and bus shelters. 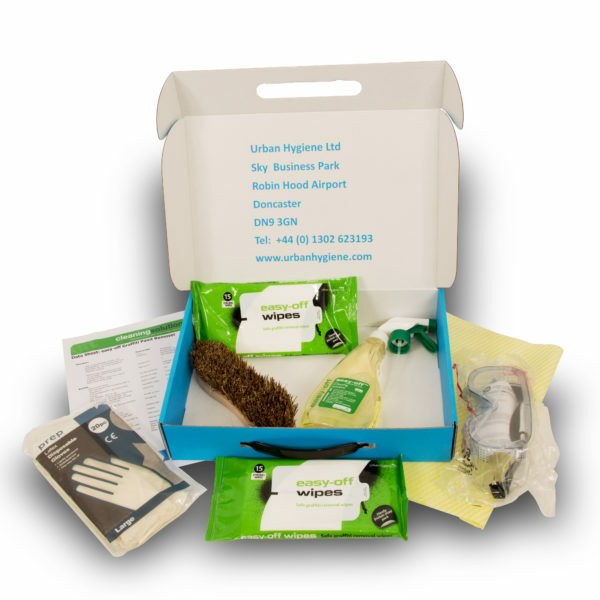 Presented in a fully recyclable tough and durable cardboard box, easy-off graffiti removal kits are the safe and environmentally friendly way to remove graffiti and clean-up your neighbourhood. Safe easy-off graffiti removal kits ONLY contain safe graffiti removal chemicals which can be used by anyone – anywhere. Members of the public and graffiti removal professionals alike agree this solvent free, biodegradable graffiti removal agent is incredibly fast acting and makes short work of both permanent marker pen and spray paint graffiti. 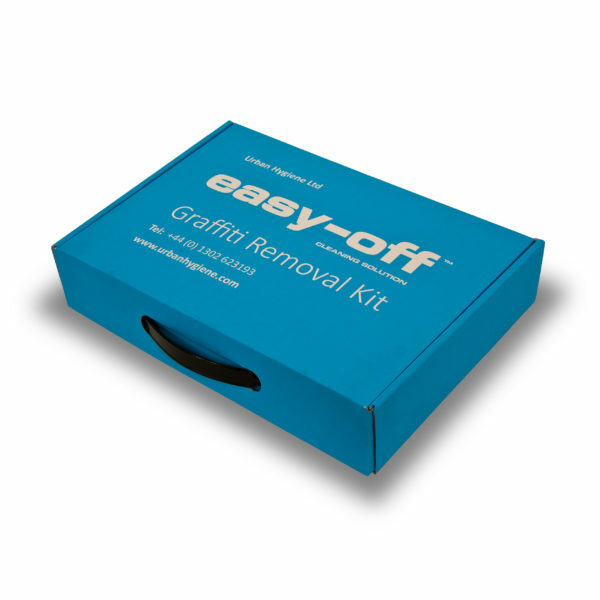 The easy-off graffiti remover contained in these kits is perfect for cleaning graffiti from park furniture, street cabinets, roller shutters, lamposts and subways walls and innumerable other surfaces in towns, villages or city centre locations. Issuing easy-off graffiti removal kits to interested members of the public or community groups in your area can make a great impact on the overall reduction in graffiti vandalism. The safe, low odour, easy-off graffiti remover contained within these kits has been approved for use in schools, hospitals and prisons and is CHIPP and COSHH compliant. Solvent free easy-off makes short work of wall based graffiti and is safe to use around the public so there’s no need to close off corridors or stairwells. Gloves and goggles are supplied as an extra precaution for the applicator ensuring everyone involved in the graffiti removal process remains safe. Trains and graffiti vandalism have always been linked. How handy to have a comprehensive and safe graffiti removal kit on each platform, ready to deploy at the fist sign of tagging. easy-off graffiti removal wipes are mild enough to use on the sides of rolling stock without damage occurring to the train paintwork. This means graffiti vandalism can be nipped in the bud before it travels to the next station on the line. With the increasing pressure on utility companies to reduce graffiti vandalism on their infrastructure, many are turning to easy-off graffiti removal kits as the handy graffiti removal solution they have been looking for. Simple to store and quick, safe and effortless to use many engineers are now being encouraged to clean graffiti from boxes once repairs have been carried out successfully.